Certain images of Goddess Lakshmi are shown as showering gold coins. This hand of Goddess Lakshmi which showers gold is known as Suvarna Hasta. It symbolizes wealth, prosperity and peace in society. For a spiritual seeker, it symbolizes the spiritual values that are timeless and universal. 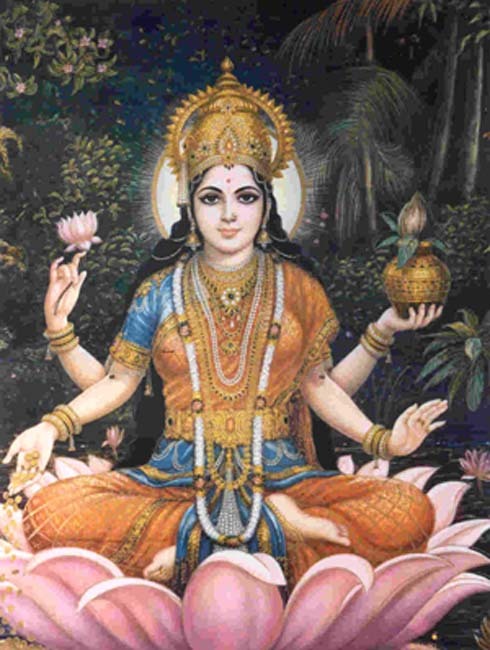 In modern society, Suvarnahasta of Goddess Lakshmi is limited to material prosperity alone. We often forget that material wealth cannot be truly enjoyed and sustained without proper spiritual values. This is one of the tragedies of present day as we find in spite of good wealth many people are unhappy. To truly enjoy the blessings of Suvarna Hasta we need to follow Dharma. Wealth should be earned through dharmic means. We should learn to curb our desires through spiritual understanding. Peace, prosperity and happiness will be constant when Dharma is followed.